Use the power of rainwater to create an amazing display on four sides of your home with these Ancient Graffiti Scalloped Rain Chains. Rain chains originated in Japan centuries ago, and these lovely, modern units will provide a wonderful look on your home while helping direct rainwater. Fluted cups along a generous, approximately 86" long chain add a floral hint to the item, and the tapered shape of each cup offers a classic look. Use the included clip to attach each chain to the outlet at the end of your gutter, easily replacing your downspouts. As the rain gently cascades down the chains, it lends soothing sounds to your backyard, and the water may be collected in a basin or barrel for use in your garden. Remove links and cups from each chain as needed, to create a truly custom length for your home. The browned copper hue on each unit meshes with your home and landscaping, while the all steel body remains sturdy for many seasons. 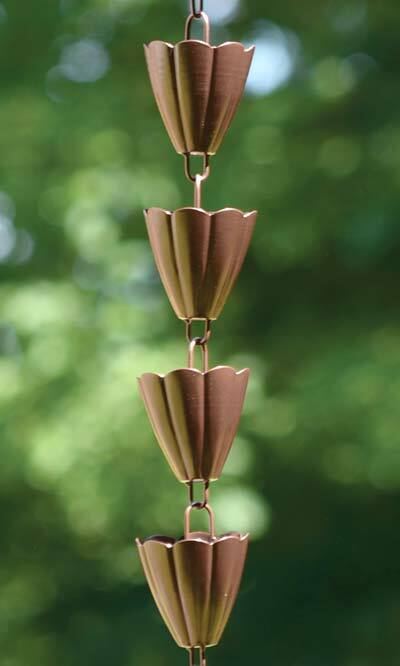 Add striking adornment to the corners of your home with these Scalloped Rain Chains. Note: This case pack includes 4 of the Ancient Graffiti Scalloped Rain Chains.